Several months ago I started up a Zelda Publications page here at Zelda Dungeon. However, with the release of the Legend of Zelda: Spirit Tracks, the project was put on hold… until now. We now have portions of the first 6 issues of Nintendo Power now online ready to be viewed. What I did is went through the magazines, and found all of the Zelda relevant information and put those pages online. You can view all the Zelda pages for the first 6 issues at our Image Gallery. Alternatively, you can take a look at the Zelda Publications page, which gives basic information about each of the first 6 issues. Expect new issues of Nintendo Power and eventually other Nintendo Publications, to be put up on our gallery frequently over the coming months. Any Nintendo fan who has been with us since the late 90’s will surely get some nostalgia out of just looking at these old magazines. Back in the day there was no Zelda Dungeon, IGN, or any internet to go to for Nintendo news, but rather, there was Nintendo Power. 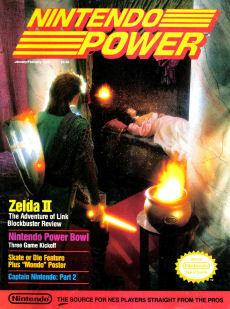 Are you one of those gamers that use to just reading Nintendo Power? Perhaps you’re a gamer who missed the glory days of Nintendo Power and wonder what all the fuss was about. Maybe your just like me and you jumped on the bandwagon a few years after the magazine started but can still appreciate the old work.